It took eleven years, two months and eight days for the Ultimate Fighting Championship to make the journey back to Japan. This is Zuffa’s first foray into the land of the rising sun and they endured numerous cultural, political and criminal road blocks along the way that stemmed from their acquisition of Pride back in 2007. The MMA market in Japan is a cracked shell of what it once was as its glory days when the grandest events and the best fights on the planet took center stage. Fans are used to their MMA events encompassing a professional wrestling atmosphere. Dana White has gone on record stating there will be no mention of Pride or any hint of theatrical spectacle to UFC 144. This is the time for the company to introduce a new business model that, hopefully, a new generation of MMA enthusiasts will latch on to. This Saturday we will be treated to 4 hours and 7 fights on pay-per-view instead of the usual three and five. This will be a very competitive fight that could determine the next contender for the lightweight title. Petis has a difficult time with wrestlers and Lauzon is good but not great at takedowns. He is tricky though which could prove to be a problem for the Duke Rofus trained fighter. Petis is the more diverse striker but J-Lau has more power in his punches. Lauzon is good early but history shows cardio down the stretch with top of the food chain opposition is his Achilles heel. I don’t think Petis is top of the food chain and I believe the Bridgewater, Massachusetts native will secure his twenty second victory. Japanese fighters have not fared well in the Octagon. Hatsu Hioki was a high profile signing for the UFC as fanboys salivated at the idea of him fighting Jose Aldo. The problem is he won his UFC debut in a bout where most people feel he didn’t win. Hioki is a phenomenal grappler who transitions from submission to submission easier than most people breathe. He has good defensive striking but has a tendency of taking punches to close the distance. Bart is the wrong guy to employ this strategy against. While the potential for him to get caught is high, Hioki’s grappling will be too much for Bartimus. Boetsch is a tough wrestler who bullies people around pure and simple. This will not be enough to beat Okami who is deceptively strong and has the technique to counter Boetsch’s wrestling and give him a taste of his own medicine. Both are coming off back-to-back losses and this is Akiyama’s debut at 170 lbs. Shields is a huge welterweight so the weight cut could be a factor since all of the fighters on the card have 17 hours to rehydrate instead of the normal 24 due to the time difference and start time. Akiyama is the better striker, but Shield’s will most likely hold him down for three boring rounds. This has the makings of an awesome heavyweight slugfest on paper. Too bad Kongo is fighting the one person on the planet who has a worse ground game than him. Hunt, the former K-1 world grand prix champion, will look for that one big punch to end Kongo’s night. Hunt is next to impossible to knock out and he hits ridiculously hard. The problem is a stiff breeze can take him down and keep him down and I expect Kongo to do the same. Rampage returns to the Saitama Super Arena where he thrilled an entire nation prior to his UFC run. Over the last several weeks he has talked about retirement, not caring about winning and just wanting to put on a show. Ryan Bader has a lot of questions to answer after his loss to an aging Tito Ortiz in July. I see Bader failing to take Rampage down and forced to strike with him. Bader has a lot of power but the former champion is the more diverse boxer who will use his wrestling to negate Bader’s offense and score the win. I’m going on record right now and predicting this to be fight of the year. 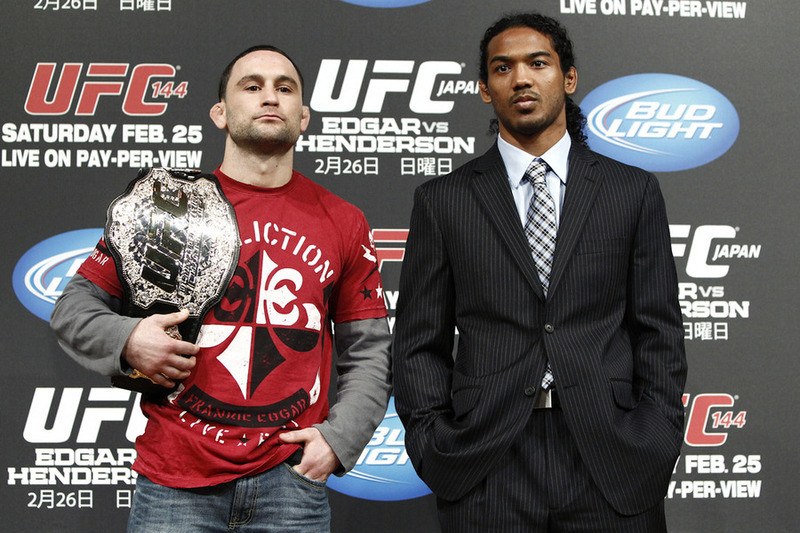 Ben Henderson is just as good a wrestler as Gray Maynard but not as strong. He is faster though which will make things difficult for Edgar because his speed advantage is not so decisive this time. The champion has superior boxing and incredible footwork. More importantly, he figures out a way to win. He never stops no matter how far behind he is. Henderson has won three straight since losing the WEC title. Both fighters are use to outworking their opponents and will keep an incredible pace in order to gain the upper hand as these two warriors will continue the tradition of tremondus lightweight battles that embody the Japanese spirit. Don’t forget about the Tiequan Zhang vs. Issei Tamura Facebook fight at 7:30 pm EST and the FX Prelims beginning at 8:00 pm EST featuring Takanori Gomi vs. Eiji Mitsuoka. ufc 144 was an amazing card. pettis hen do 2 needs to happen. frankie drop down to 145 and faces aldo cause your a warrior. Will Thanos Deliver in Infinity War? What if the Fake Diesel and Razor Ramon Actually Worked? Is Charlotte Flair The Problem?